I want to talk about some of these aspects of the film, but let’s follow the horse for a while. You notice that Herzog keeps returning to animals in Aguirre, using animal images like a repeated musical drone that runs alongside the film’s vibrant main character and episodic plotline, which is about colonialism and its effects. Think of the prehistoric nebulousness of the sleeping creature Aguirre shows his daughter, the family of rodents that does its own colonizing of the raft, butterflies, pigs, and of course the complete anarchy of the monkeys in the final sequence—Aguirre’s last group of unruly followers. These animals may summon up a sense of mystery, like the staring horse, but they also give an almost comic deadpan reaction to the ludicrously overblown ambitions of the people in the film—who are fond of looking out over the jungle and declaring their supremacy over it—so beautifully crystallized by the monkeys swarming away from their demented lord Aguirre and high-tailing it away from the raft. It’s a little like the disturbing and very blackly comic effect of watching the footage of Timothy Treadwell in Grizzly Man as he interacts with the bears and goes into Whitmanesque rhapsodies about how loving they are and how sacred his relationship with them is, all the while the bears wear their perpetual expression of hungry curiosity about whether this intruder might be tonight’s dinner. Herzog also calls upon nature itself to provide a deadpan, indifferent backdrop to the machinations and bloodlust of the people on Aguirre’s river. For instance, there is a shot early in the film that serves as an introduction to the river—Herzog’s camera simply stares into the churning of the rapids, and holds the shot longer than usual, until we may begin to wonder why we are staring at it so long. Herzog makes us see the river, its force, its implacability, as though he already knows that this shot continues in some mysterious way after he has cut away from it, as all rivers always continue, and this one will too, long after the blind hopes of the conquistadors have been erased. That shot, with its hypnotic Popol Vuh music, also reinforces the feeling of this film as an extended, druggy dream, a feeling that prevails from the vertiginous opening shots onward. Of course the jungle is blank space to Aguirre and his men; but it is in fact full of strange sounds and creatures, exotic birdcalls, practically unseen natives with their own ideas and traditions, which might be cannibalistic or might be a humble sense that God is not finished with their river. The problem is the Spanish don’t register any of this and thus can’t adapt themselves to the jungle, but they go through the ineffectual motions of trying to impose their system on it. Thus the weirdly comic scenes of parchments solemnly signed and trials held and royalty crowned in the midst of the humid tangle of the rain forest. It goes without saying that religion is especially ill-fitting here, and Herzog saves some of his most withering asides for the church and its representatives. Early on, when someone says that “As long as the Virgin Mary is with us…” Herzog cuts on the line to an impenetrable shot of the dense jungle, which trumps the religious doctrine. We already know, from Herzog’s visual language, which one will triumph. Such a powerful disconnect between reality and perception is doomed to derange the individual, Aguirre, as well as the collective group. When we first see him, Aguirre has already been deformed in body, his lurching around in crabbed movements recalling perhaps Richard III and his hunchbacked lust for power. But Herzog’s film might relate better to another Shakespeare play, The Tempest, although Aguirre is far from a Prospero of his jungle domain—more like a Caliban vaulted to center stage, still crippled and impassioned. But at least when we meet Aguirre he is smarter and craftier than the people around him, possessing a sardonic view of his betters and a grasp of how to manipulate people. But even he goes to pieces as the film goes on. For instance, that device of characters staring at the camera, which breaks the perfect illusion of a proscenium. For that matter, one never really gets used to all those heavy German voices coming out of the mouths of supposedly Spanish characters. Also, notice Herzog’s use of narrative holes at various points in the plot. For instance, there is a bit of suspense generated by the repeated assertion that one imprisoned character is hiding something in his hand. This becomes a source of curiosity, and we might be reasonably assured that there will be some payoff. But Herzog drops it completely, and we never find out what it was. Similarly, a prisoner escapes, and there is some fear amongst the soldiers that they might be in danger. But Herzog never mentions the escaped man again. And there are the men trapped on the raft, caught in the eddy of the river, whose guns fire mysteriously at night and whose bodies are found in the morning. We don’t learn what happened to them, although if anything this enigma adds to the feeling of danger that lurks in the trees lining the water. Think, too, of the jarring shifts in tone. A soldier on the raft is speared by a native javelin, and observes before he dies that “These long arrows are becoming fashionable.” Of course this peculiar humor jibes with the upcoming scenes of soldiers convinced the arrows hitting them are not real, but it’s also part of a disorienting tactic that Herzog uses in a number of his films, as though the prankster in him had to run in and mess up the very careful themes and ideas of Herzog the serious filmmaker. “God didn’t finish his creation on the river,” and perhaps Herzog did not finish his creation either, leaving it deliberately incomplete, the better to jar us out of any romanticized attachment to Aguirre or the story. Jarring too are the inclusion of what appear to be accidents, out-of-control moments that Herzog decided to use. One of the first things we see after the astonishing opening shot of the line of people trailing down the South American mountainside is an awkward shot of a cage dropping down the cliff, as though photographed on the fly. The scenes of the party moving through the mud do not appear to involve acting so much as the people onscreen trying not to kill themselves with the heavy load. The monkeys on the raft, of course, are an example of Herzog deliberately setting up a scene to invite chaos, since no one can direct monkeys, unless Herzog has powers of persuasion that boggle the mind. And with the most photogenic wild animal in the film, Klaus Kinski, onscreen for most of the running time, the viewer never knows what might happen. 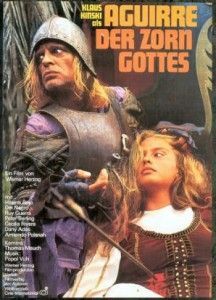 You can barely register it unless you’re looking for it, but there is a shot in the film where Kinski got so into character that he brought his sword down on the head of a fellow actor and was saved from manslaughter only by the helmet on the man’s head, which took the brunt of the blow. Perhaps Herzog is inviting us to draw another parallel by including this “accidents” in the movie. In talking about Aguirre, he has explicitly noted the similarities between the storyline and the making of the film itself, the foolhardiness of a young German director going into the Peruvian jungle to make a feature film with a stolen camera on a small budget. He is surely aware that a film director is a kind of conquistador, arrogantly claiming his dominion over an exotic land and presuming to put order on it. Herzog has coolness and perspective, however, and Aguirre does not—although Herzog’s own testimony of going a little crazy during the shooting of the film suggests that the disintegration of his moviemaking quest might have been a near thing. One final thought on staring into the camera. At times Herzog includes scenes with an Indian man playing pipes, who also disconcertingly stares into the camera lens. This is not an actor but a developmentally disabled man that Herzog found playing music in the street in Lima or somewhere, and whom he wanted in his film. The man’s gaze, which is not acting but a kind of documentary record, confronts our own, and at times such as this we might conclude that Herzog is using the held gaze to reflect back our own act of looking at the movie screen. 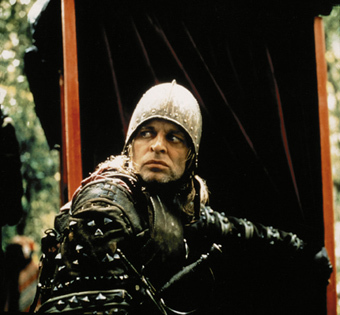 The mirror held up in Aguirre the Wrath of God fills Herzog with dread and dissatisfaction. I think Herzog’s view has grown more forgiving since this film, and the mad conquistador of Grizzly Man is at least allowed his moments of lyricism and sympathy. But still lurking in the background is the face of the grizzly bear, ready to end the discussion with the finality and certainty of blank nature.